Nintendo has confirmed that two new Nintendo Switch models are coming and we’re already excited about the possibilities! Could the company make the Switch more powerful? Will it improve battery life? Could there be some deeper changes to the console’s design that we can’t even envision? Only time will tell! When it comes to playing the Switch as a portable console, one of the biggest complaints most people have is the battery life. Because of the relatively large screen and fairly powerful hardware, the Switch just doesn’t last long enough on a single charge. With the next Nintendo Switch, we hope the company figures out a way to make the battery last a little longer. Whether that comes from including a larger battery in the console, or optimizing the way it drains power, having a Switch that could last a couple extra hours might be reason enough to upgrade to the new one. Another issue I have with the Switch is how much space is wasted on the bezel. With the trend of smartphones and TVs going bezel-less, it would make sense for Nintendo to do the same. This would allow the device to either have a slighter bigger screen while maintaining the same form factor or to keep the same size screen while actually shrinking the footprint of the console itself. Either way, it would make the console look quite a bit better, as there would be far less wasted space on unnecessary plastic and more beautiful screen to enjoy, which is always a good thing. This is kind of a no-brainer, but the launch Nintendo Switch didn’t come with even close to enough internal storage. 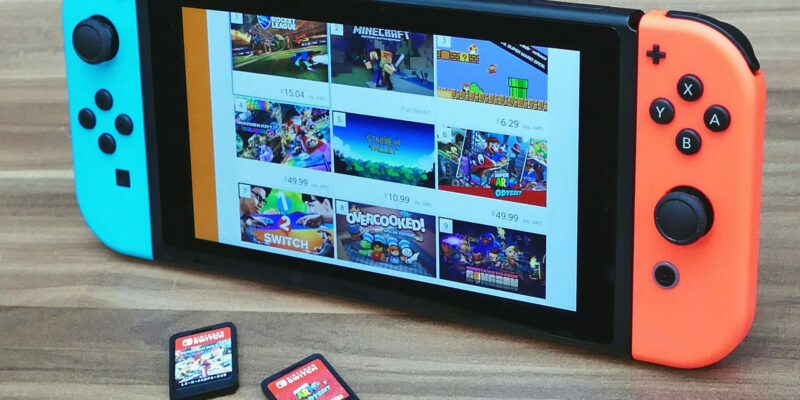 It comes with an incredibly underwhelming 32GB of storage, which is just not enough for today’s digitally-purchased games, even when scaled down to the Switch’s lower specs. I’d like to see that at least doubled but preferably bumped to 128GB. To give you an idea of how small the storage is, I purchased Diablo III recently, and I already had Smash Bros. installed on my console. I had to delete Smash in order to install Diablo, which is just ridiculous. I don’t expect the console to be able to hold my entire collection of digital games, but the fact that it can’t hold two AAA releases is just ridiculous. This one might be difficult for Nintendo to execute along with the previous requests (bigger battery and bigger screen), but perhaps with a change in materials the company could find a way to decrease the weight of the console. This would make long play sessions far more enjoyable, as the Switch does cause a bit of hand fatigue after a while. Thankfully, I don’t work in console development, so I don’t need to worry about how Nintendo is to make it happen. No doubt it won’t be easy, but if there’s one thing I have faith in Nintendo’s ability to do, it’s iterate on its handheld consoles in ways we don’t even think of. When a new console releases, one thing you almost always imagine is more power. Obviously, Nintendo needs to be careful how it does this, as the Switch 2 isn’t aiming to be a new platform, but rather, it’s an upgrade to the existing model. Still, Nintendo managed to pull it off with the 3DS, and we think the company will be able to add more RAM and make some incremental graphical changes to the new Switch without wrecking the experience for players with an original console. In the grand scheme of changes, this one is pretty minor, but it would still be nice to have. I recently had to bring my Switch, including the dock, on a trip, and I have to say that the dock is a little too big too carry around comfortably. I’d much rather see just a simple cable with the dock’s components on a small box instead of a big hulking plastic device. This would make it much easier to bring the Switch around to friend’s houses or on long trips. Are You Excited for the Next Nintendo Switch? We’re getting close to hearing exactly what the new Nintendo Switch is, and it’s quite exciting. Hopefully, Nintendo makes the right moves with the next iteration of its wildly popular portable/home console hybrid.